Harley-Davidson is excited to share a preview of the 2019 NHRA Screamin’ Eagle/Vance & Hines Drag Team and Harley-Davidson Factory Flat Track Team seasons. 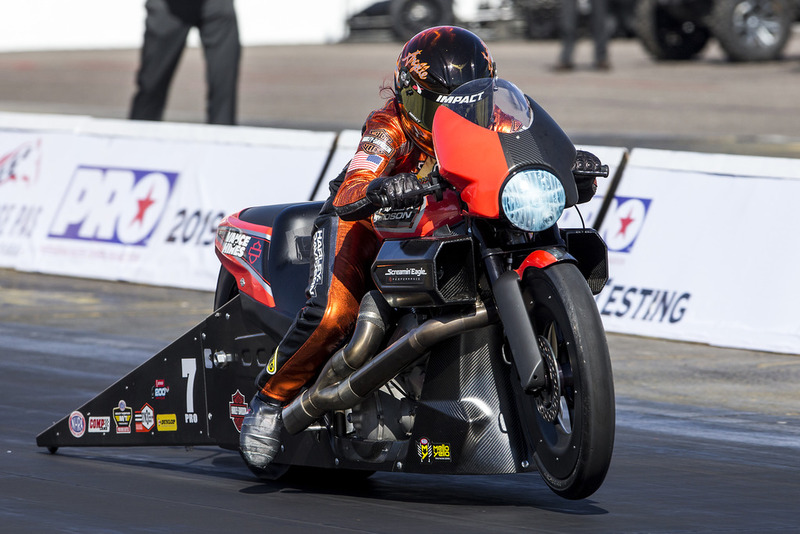 The Harley-Davidson® Screamin’ Eagle®/Vance & Hines drag racing team opens its 17th season of NHRA Pro Stock Motorcycle competition at the 50th Amalie Motor Oil NHRA Gatornationals, March 14-17 in Gainesville, Fla. The team will begin pursuit of a 10th Pro Stock Motorcycle championship with a three-rider squad, as Angelle Sampey joins Andrew Hines and Ed Krawiec on Harley-Davidson® Street Rod™ competition motorcycles. The trio of veteran riders have won a combined 12 NHRA Pro Stock Motorcycle titles. The Harley-Davidson Screamin’ Eagle/Vance & Hines team races competition drag bikes are inspired by the Harley-Davidson Street Rod production motorcycle, an agile middle-weight powered by the liquid-cooled High Output Revolution X 750 engine. 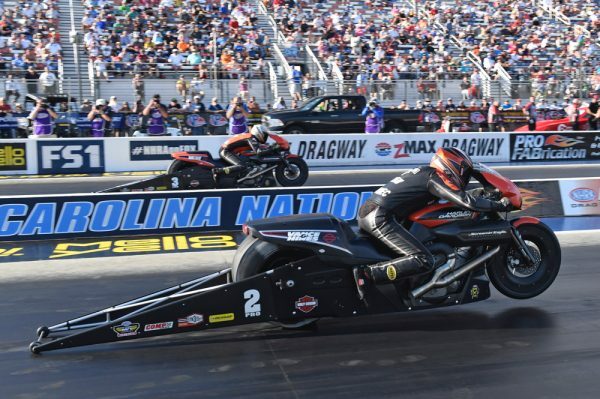 The Gatornationals is the first of 16 Pro Stock Motorcycle events on the 2019 NHRA Mello Yellow Drag Racing Series schedule. After the first 10 events, the points are re-set for the top-10 riders that then qualify for the Countdown to the Championship playoffs (the final six races), with the season ending in November at the Auto Club NHRA Finals in Pomona, Calif. The Harley-Davidson® Factory Flat Track Racing Team is preparing to open the 2019 American Flat Track (AFT) Twins season on March 14 at the Daytona TT at Daytona International Speedway in Daytona Beach, Fla. Factory Team riders Sammy Halbert and Jarod Vanderkooi will contest the 18-race AFT series aboard Harley-Davidson® XG750R competition motorcycles prepared by Factory Team partner Vance & Hines Motorsports. The team will field an all-new XG750R flat tracker for 2019, according to Vance, with a new chassis and a revised liquid-cooled, fuel-injected and race-tuned 750cc Harley-Davidson® Revolution X™ V-Twin based on the production engine originally designed for the Harley-Davidson Street 750 motorcycle. The Daytona TT will provide an interesting test for the Harley Factory Team and other AFT competitors. A new 0.6-mile course will for the first time utilize the paved front straight of the historic Daytona International Speedway tri-oval, requiring racers to transition from dirt to pavement to dirt on each lap while negotiating left- and right-hand turns and a jump on the dirt section laid out on the infield of the speedway. Flat track is the most-historic form of American motorcycle racing and Harley-Davidson has been part of the sport since the heyday of the Harley “Wrecking Crew” teams of the 1920s. 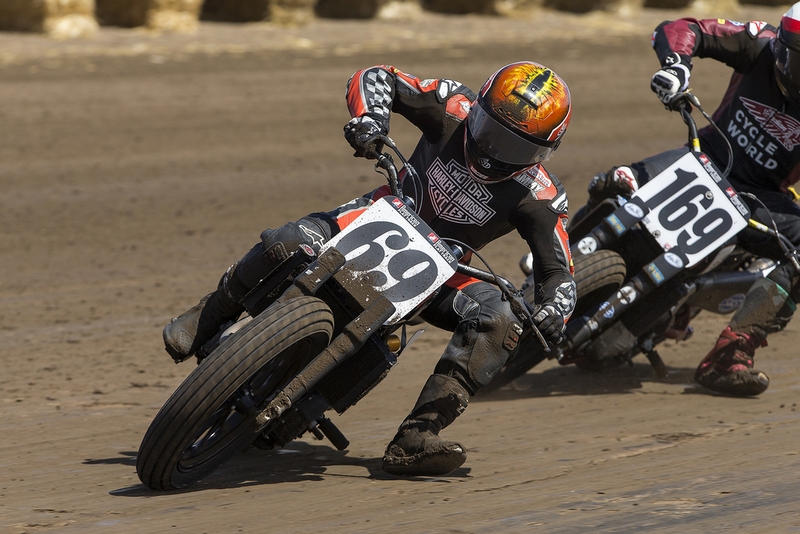 In 2019 the Harley-Davidson Factory Flat Track Racing Team will compete on a diverse 18-event AFT Twins schedule that includes six miles, five half-miles, three short tracks and four TT courses. After a one-year hiatus So-Cal Half Mile at Perris Auto Speedway in Perris, Calif., (May 11) returns to the schedule. 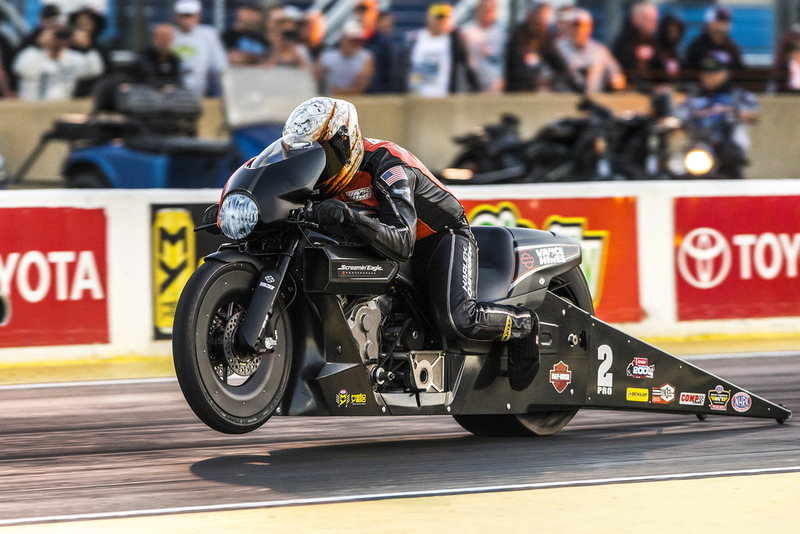 In an all-Harley final round, Krawiec defeated his Harley-Davidson Screamin’ Eagle/Vance & Hines teammate Andrew Hines in the first head-to-head face-off of the new Harley-Davidson Street Rod competition drag bikes. 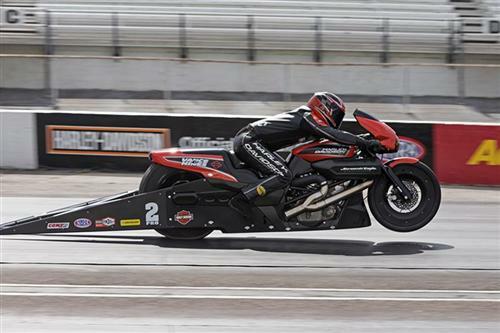 Krawiec scored the 40th win of his career on Sunday while setting the low ET (6.826 seconds) and fastest top speed (197.74 mph) of the event for Pro Stock Motorcycle eliminations. In a weekend dominated by the two Harley racers, Hines secured the top qualifying position with a best elapsed time (ET) of 6.825 seconds at 196.50 mph. Krawiec qualified his Street Rod drag bike second at 6.836 seconds and 195.00 mph. On Sunday, Krawiec and Hines battered the Pro Stock Motorcycle field, and for the 20th time the two former champions lined up to face each other in a final round battle. On this afternoon, Krawiec prevailed with a 6.850-second blast to better the 6.911-second pass posted by Hines. 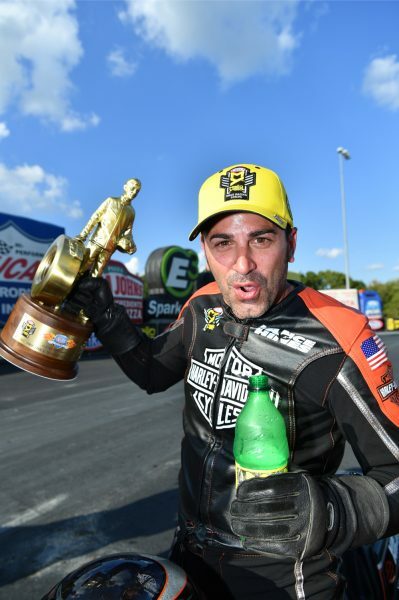 After the first of six rounds in the 2017 NHRA Mello Yello Countdown to the Championship playoffs, Krawiec leads the Pro Stock Motorcycle class with 2,202 points. Hines is in fourth place with 2,144 points. The Harley-Davidson® Screamin’ Eagle®/Vance & Hines Pro Stock Motorcycle drag racing team returns to action September 22-24 at the Dodge NHRA Nationals at Maple Grove Raceway in Mohnton, Pa. The Harley-Davidson Street Rod will hit the drag strip this weekend when the Harley-Davidson Screamin’ Eagle/Vance & Hines drag racing team debuts all-new Street Rod-inspired bodywork for its Pro Stock Motorcycle competition bikes at the NHRA Summer Nationals, June 8-11, at Old Bridge Township Raceway Park, Englishtown, N.J.
Don’t miss the video… Read More. The Harley-Davidson® Screamin’ Eagle®/Vance & Hines team remains undefeated in 2012 as rider Ed Krawiec won his second NHRA Pro Stock Motorcycle event of the season and regained the series points lead at the 32nd Annual Summit Racing Equipment NHRA Southern Nationals at Atlanta Dragway. © 2019 Bikernet Blog - Online Biker Magazine. All Rights Reserved.